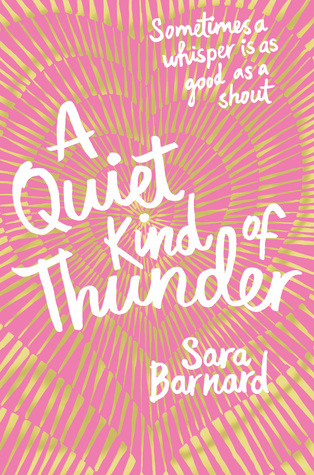 A Quiet Kind of Thunder by Sara Barnard is out today. This is the story of Steffi who has selective mutism for most of her life and she is starting to feel invisible. But Rhys, the new boy at school, sees her. He's deaf, and her knowledge of basic sign language means that she's assigned to look after him. To Rhys it doesn't matter that Steffi doesn't talk and, as they find ways to communicate, Steffi finds that she does have a voice, and that she's falling in love with the one person who makes her feel brave enough to use it. The lovely team at My Kind of Book have asked bloggers to help them celebrate the release of Sara Barnard's brilliant novel A Quiet Kind of Thunder they've reached out to the blogging community to undertake a challenge: spend a day, just one day, imagining what it might be like not to be able to use the power of words, just like Steffi who suffers from selective mutism struggles in the book. This isn't a sponsored silence, they're asking people to think about their day from the moment they wake up to the second they go to bed. Lovely, thoughtful review, Laura. How terrible it would be to be unable to communicate through speech. When times are tough it is good to consider the difficulties other people live with each day of their lives. Thank you so much Wendy. It really does open your eyes.